Windows/Mac/Linux (All platforms): Google Desktop's gadgets are looking more helpful these days, with the addition of an official Google Calendar gadget that puts your appointments at your fingertips. Like the previously mentioned Gmail gadget, Google's own Calendar gadget offers quick access to straight-up GCal or Google Apps calendars, and allows for multiple instances if you're on lots of different schedules. Pull it up with the Shift-Shift tap for Desktop gadgets, and you can view your appointments in day-by-day, monthly calendar/agenda, or agenda-only view. Here's a full shot of what it looks like—while Google's blog post shows a map being drawn for location-specific items, it wasn't drawing on my screen for some reason. 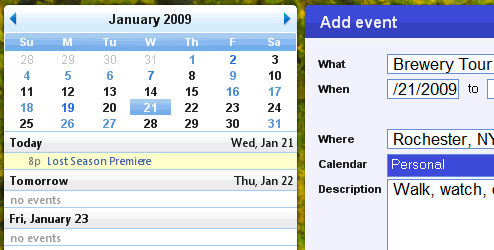 Unlike the Gmail gadget, the Google Calendar Gadget runs on Google Desktop 5 for Macs and Linux, as well as Windows. 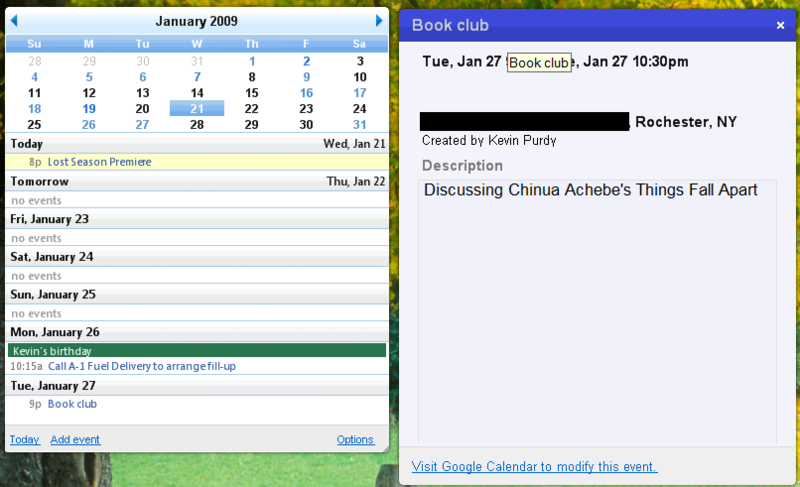 It's free, requires Google Desktop 5 and a Google Calendar account.